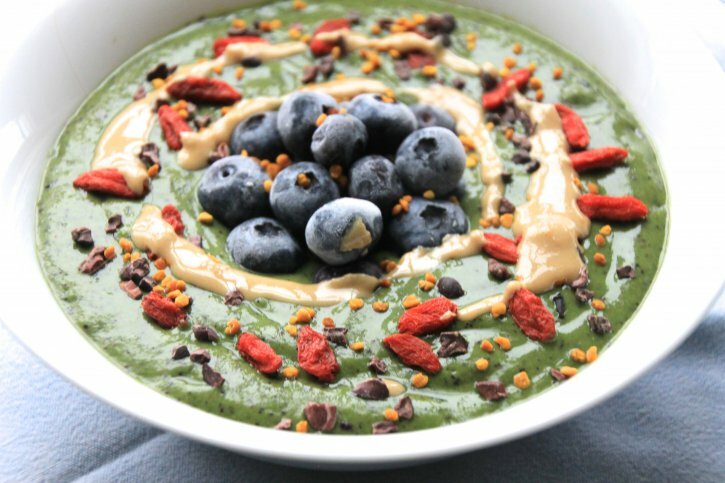 Anyone who follows me on Instagram will know i am a huge fan of smoothie bowls, the green kind in particular! Having such a nutrient packed meal so early on in the day, honestly sets you up for the best day possible. For those of you who are new to these delicious breakfast bowls, what they are is a condensed smoothie; Basically you use less liquid to blend the smoothie, making it far thicker and creamier blending it into almost a yoghurt consistency. This makes for a really hearty breakfast, that’s bursting with nutrients, and gives you the most amazing amount of energy. In this recipe we use banana and avocado as our base. I often get strange looks when I tell people i love to use avocados in smoothies, it’s definitely not normally associated with sweeter flavours, but trust me in a smoothie like this it tastes divine, and really makes it so wonderfully creamy. Avocados are one of my absolute favourite foods, and are so good for you, so i try and sneak them into my meals whenever i can! They’re so incredibly nutrient dense containing 25 powerful nutrients including Vitamin A,B,C,E, & K, copper, phosphorus, magnesium, potassium and iron. They also contain a wealth of healthy fats, which help promote the growth of strong, lean muscles. They also help to boost your metabolism, and therefore actually help you to burn the bad saturated fats you may eat in other foods. The blueberries, are a great source of antioxidants, and with the avocado also help to reduce inflammation. In this recipe the blueberries and banana are frozen which creates an even creamier feel to the smoothie bowl, and tastes a little like melted ice-cream! To make this smoothie deep green we add spinach and kale. Don’t worry, your not going to be drinking a horrible green drink, a couple of handfuls of these super greens only add to the nutrients and son’t disturb the flavour! Kale & Spinach are both a potent source of antioxidants and are one of the best alkaline foods, just a few handfuls in your smoothie enhances the nourishment ten fold. Once this is all blended up you can add any sweet toppings you like! I love my granola, a drizzle of almond butter and a sprinkling of bee pollen. Simply blend all ingredients for the smoothie in your blender until smooth. 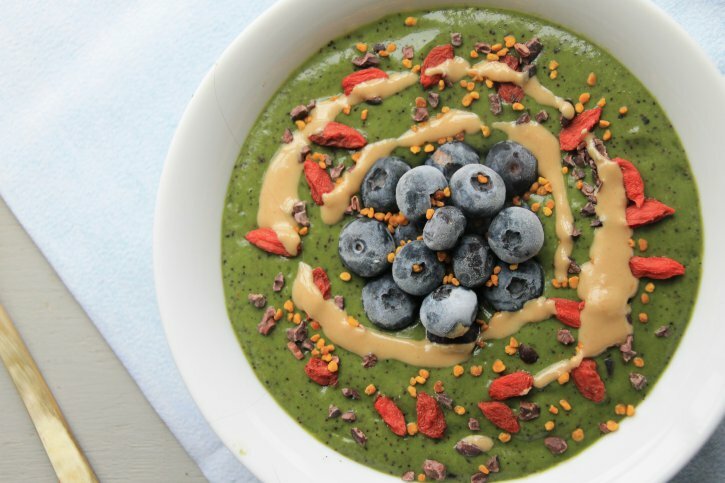 Pour into a bowl, add your favourite toppings and enjoy!